In the context of a research on the side aspects of the « Battle of Mons » on August the 23rd 1914, we are looking for details regarding the presence of the 1st battalion of the Gloucestershire Regiment (6th Brigade - 1st Division) in Haulchin, Belgium, just 8 miles south-east of Mons. 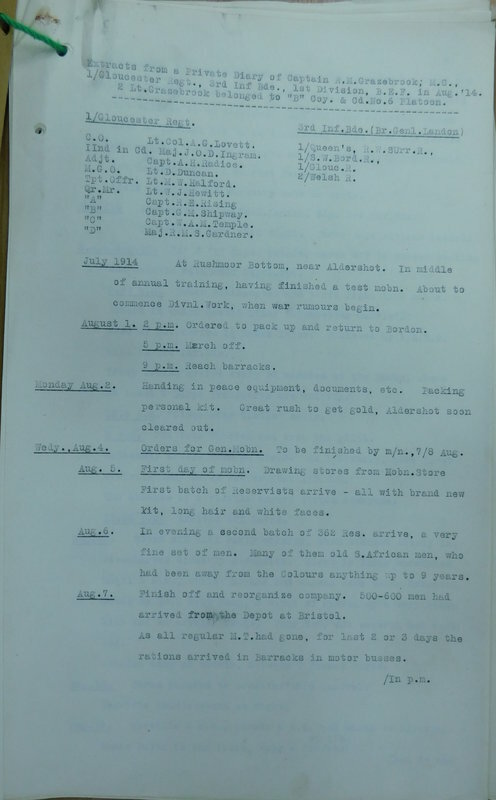 We were able to collect the War Diaries of the Battalion ((WO95/1278/1), of the 26th Company Royal Filed Engineers (WO95/1253/1) and of the Brigade HQ of the 3rd Infantry Brigade. We also bought Everard Wyrall’s, R.M. Grazebrook’s and P.R. Littlewood’s books, from which we translated all relevant passages. Unfortunately, the page for 23rd August is missing in the Diary. So we are wondering, if someone would know if there exist some correspondences by officers, non-commissioned officers or soldiers dated from between the 22th & 25th of August 1914. And of course, if yes, how we could consult them? The most likely places for any archived correspondence would be the Regimental Museum, the Liddle Collection at the University of Leeds and the Imperial War Museum. The Liddle and IWM collection details are available online. I would recommend an initial broad search simply on "Gloucestershire" and then read the summary details of each archived colleciton to see if it relates to the period. The documents themselves are not available online and you'd need to visit the collections to view them. If there were any officers taken prisoner on these days, a report detailing the circumstances is likely to be in their service file , held by the National Archives. A final source of information might be in any newspaper obituaries for any of the men killed. It may be worth taking a one month subscription to the British Newspaper Archive to search for names. Other than that, contact with the relevent local history libraries might be worthwhile. Thanks for the information provided, it's been very helpful, we were able to get some very interesting documents from the Soldiers of Gloucestershire Museum. We're still looking after a good quality photograph of Lt-Col Charles Steer Davidson, commander of the 2nd Battalion South Staffordshire Regiment in August 1914. The Officers of the 2nd Battalion, The South Staffordshire Regiment, taken at Aldershot on 6 August 1914. Lieutenant-Colonel Davidson is sat in the centre of the group, directly behind the visiting officer from the Japanese Army. 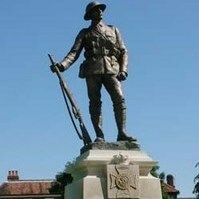 Interests:Avatar is the memorial to the ASC Remount Depot located at Romsey, photo courtesy of sotonmate. We're now looking for a War Diary or any other information source regarding the whereabouts of the 50th Battery RFA on 23rd & 24th August 1914 in Vellereile-le-Sec (Belgium). Interests:The Rifle Brigade,The 8th Rifle Brigade & 14th (Light) Division. This is a record of the battalion written by Lieut. R. Grazebrook, 1st Gloucesters regarding the 23rd and appears in the CAB45 papers. thank you very much for the document you sent, it is exceptional. We fit it between the R. M. Grazebrook campaign book, of which we had received a copy from the Gloucesters Museum and the book of Edward Wyrall of 1931. These writings are indeed very interesting to us. Would it be possible to have a copy of pages 1 to 3 and 6, as well as the exact date of release of the document? On the 23rd August 1914 around 4 to 6PM, B & D Companies of the 1st Battalion King’s Royal Rifle Corps were taken under German artillery fire. These 2 Companies were forced to fall back into the 1st Gloucester’s entrenchments in Haulchin. It was the first time of the war they came under fire. 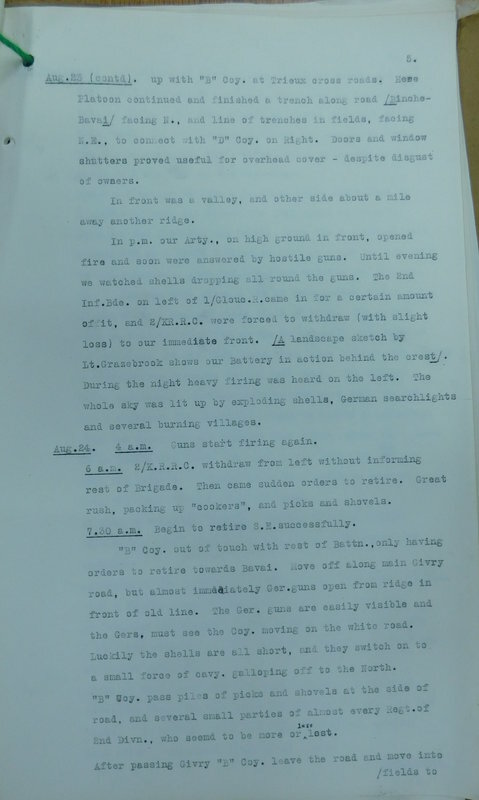 Who anyone know if there are letters or writings from B & D Companies soldiers, in which they would relate this first experience of enemy fire? We’re looking for a photograph and a small biography of Soldier George Morris (registration nr. 70399) of 9th Battery, 41st Brigade RFA. He was born in Ratcliffe, and was killed on 23rd August 1914 near Estienne-au-Mont (Belgium), victim of the German howitzers firing from Bray (Belgium). In the night of 23th to 24th August, Lieutenant H. Hardingue from C Squadron 15 Hussars is tasked, by the 1st Division HQ in Rouveroy Castle, with crossing the lines to go observe the Germans. Early morning on the 24th, he reaches the Church in Estinnes-au-Mont, hides men & horses around, climbs with a few elite men to the top of the belltower and takes notes of all German movements. We’re looking for a photo and a biography of this officer – this to illustrate a forthcoming study. See requested pages, the account of early doing's goes on for 20 pages. 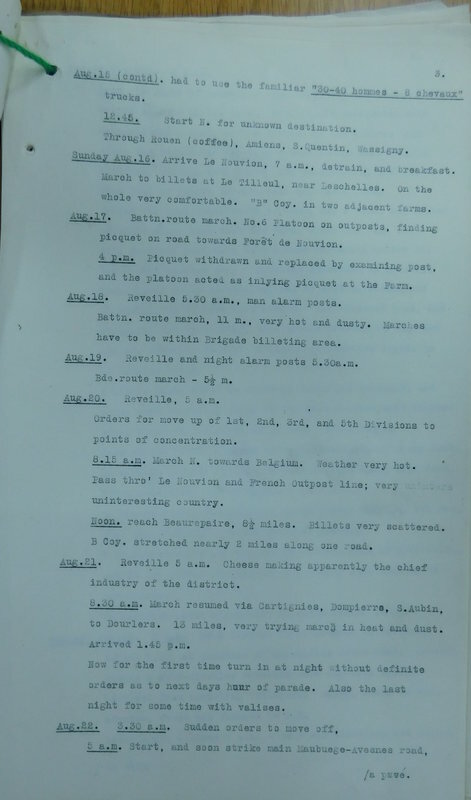 The 1/KRRC battalion war diary states they passed GIVRY and marched 4 miles (~6.5km) NE-wards to just short of ESTINNES-AU-MONT arriving at approx. 11:30hrs and immediately entrenched. Dispositions thus: D Coy (Capt. LEGARD) along the railway embankment. C Coy along a track running NW (the minor road to VELLEREILLES-LE-SEC) with their right on the main Givry-Estinnes road near the railway station. B Coy (Capt. MacLACHLAN) were to the left of C Coy. A Coy were in Reserve at the SUGAR FACTORY just W of HAULCHIN. 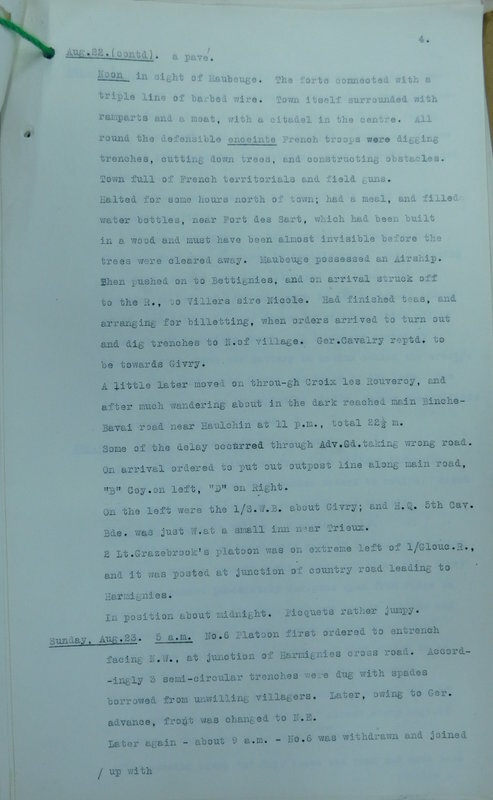 Artillery fire began from approximately 16:00hrs for 90 mins with a lot of fire round B Coy's trenches, but no mention of any units moving as a result. The KRRC Chronicle mentions this German barrage followed an overflight by a German aircraft and that the intended targets seemed to be the British artillery batteries nearby rather than the infantry trenches. According to the map in the OH, this appears to be the location of 9th Battery, XLI Brigade, RFA, who were defending the Estinnes Station area with 6 Inf Bde, but the 2nd Division History has them further back towards Givry. The artillery disposition map from Farndale's RA History linked out to by Edward above, points to 70th Battery, XXXIV Brigade, RFA being the battery closest to the 1/KRRC positions, but the OH and the 2nd Div History both have 70th Bty at Vellereille. 1/Gloucesters were to the S of 1/KRRC on the other side of the Givry-Estinnes road. Another enemy barrage began c. 03:00hrs the following night (24 Aug 1914) but no fire fell on the infantry trenches. The implication seems they had not moved, but it is not explicit. There were no casualties sustained by 1/KRRC. It was indeed their first time under shell fire since landing at Rouen ten days earlier. 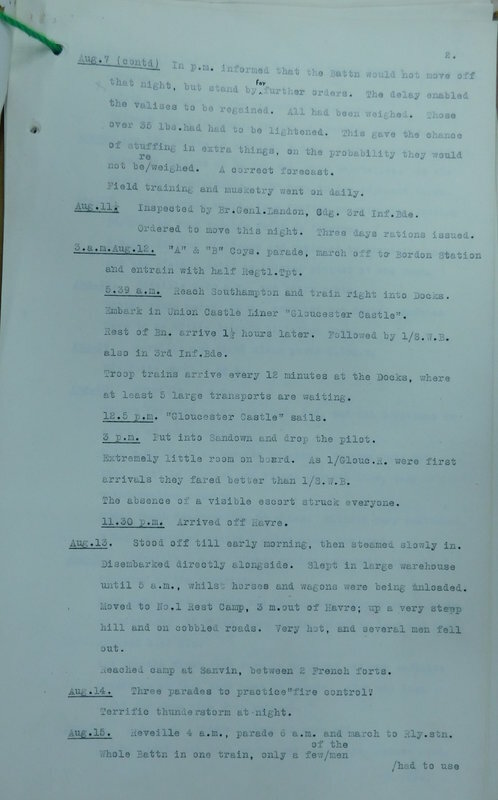 2/KRRC were also close to HAULCHIN on 23 Aug. Their diary mentions the German artillery engaging 2nd Division to their N, but they did not come under fire themselves. 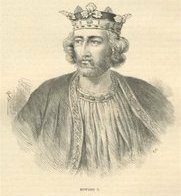 2/KRRC moved to GIVRY during the early evening, then to HARMIGNIES. There are no published accounts from 1/KRRC covering this period. 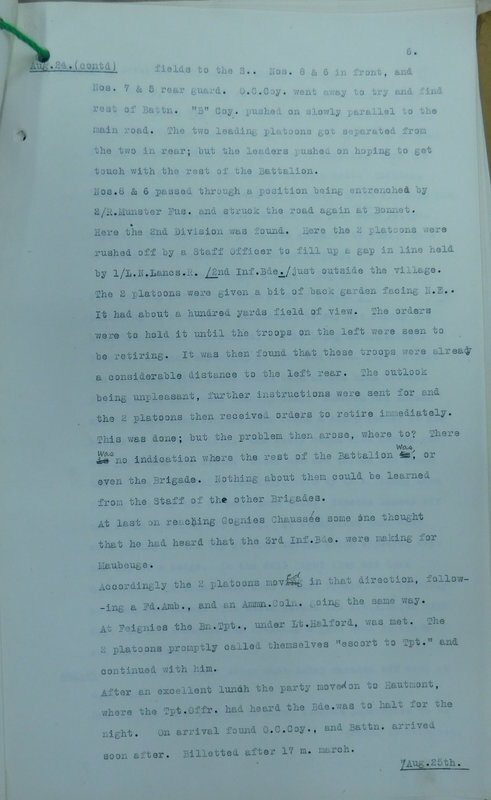 There is a scrapbook kept by the wife of one of the officers, but it does not mention the 23 Aug action. Are you aware that the actions of Corporal Garforth, (? B Sqn? ), 15th Hussars, at Harmignies on 23 Aug 1914 were part of the citation of his award of the Victoria Cross? That perhaps lends weight to the OH map mentioned in my text below, which has 9/XLI as the battery closest to Estinnes (I've followed the Belgian spellings) with 70/XXXIV higher up on the ridge to the N of the Givry-Estinnes road. The 1/KRRC battalion war diary states they passed GIVRY and marched 4 miles (~6.5km) NE-wards to just short of ESTINNES-AU-MONT arriving at approx. 11:30hrs and immediately entrenched. Many thanks to everybody for your help & your information (and sorry for the late acknoledgment & answer). would it be possible to have a,nlarger view of the card of the OH, showing the surroundings up to about Peissant/Grand-Reng? would it be possible to have a,nlarger view of the card of the OH, showing the surroundings up to about Peissant﻿/Grand-Reng? The 2nd Div History map has nothing south of Givry.